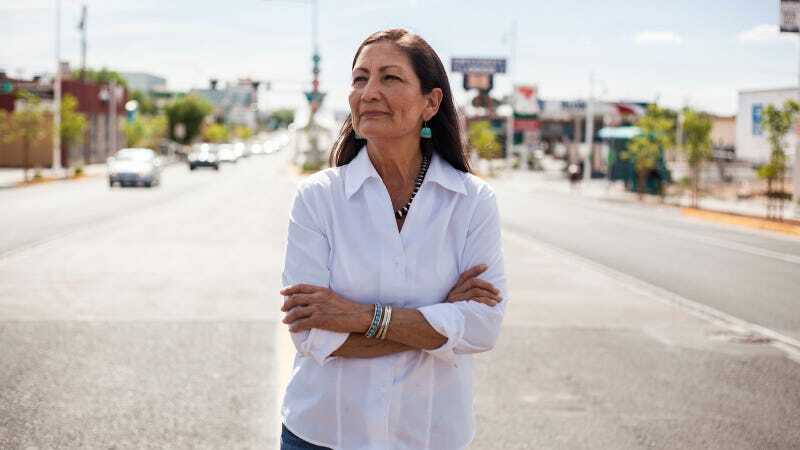 The wave of progressive women winning primaries continues, and New Mexico’s Deb Haaland is one of the biggest stand-outs from Tuesday’s primary elections, which were held in California, Iowa, Montana, New Jersey, Alabama, South Dakota, and Mississippi. Water rights attorney Xochitl Torres Small won the Democratic nomination in New Mexico’s 2nd Congressional District, where she will face off against Republican state Rep. Yvette Herrell. “I’m really just so grateful to the grassroots campaign and the volunteers that have been working hard to make this happen,” Torres Small told the Las Cruces Sun News of her primary win. In Iowa, Cindy Axne, a small business owner and former state official who supports a public option for healthcare, won the 3rd Congressional District and faces Republican Rep. David Young in area that leans Republican. Abby Finkenauer, a 29-year-old two-term state legislator, won the Democratic primary in Iowa’s 1st Congressional district. CNN reports that Finkenauer and Axne could become the first women Iowa sends to the House, and Finkenauer would be the youngest woman elected to Congress. Finkenauer has opposed Iowa’s various extreme anti-abortion bills, including a heartbeat bill that effectively bans abortion at six weeks. With 75 percent of the vote, navy veteran and former federal prosecutor Miki Sherrill easily won New Jersey’s 11th district, which Democrats hope to flip in November. Californians nominated incumbent Senator Dianne Feinstein, one of the state’s longest serving politicians and an older generation of centrist Democrats forced to swing farther left after pressure from progressive challengers, like state senator Kevin de León. Bloomberg reports that so far, more than a third of women running for House or Senate seats advanced in the primary elections—at least 35 out of 92 women running. Of the 252 women who’ve run so far, 116 have won primary elections, and there are more than 200 women still in the running for upcoming elections. Trump’s election has motivated a record number of women to run for House seats, one of the few bright spots in a dreary landscape of doom.